This weekend Vince and I attended a 1950's Luau themed party hosted by one of my professors. I wanted to have appropriately themed attire to wear. 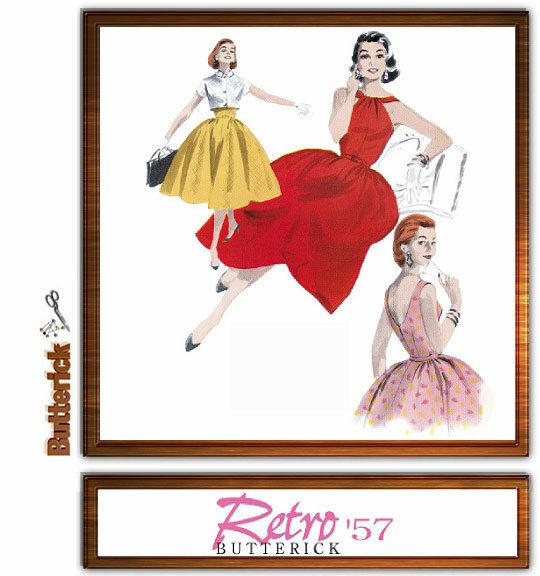 Although I already had several 1950's dresses that would have suited the bill, I also had this fabulous fabric lying around and a reprint vintage Butterick pattern that I had been itching to make something from. So, I opted to make a quick 1950's dress. This dress was very satisfying to sew because it could be completed in a weekend...unlike so many period dresses that I sew. I used the bodice pattern from the vintage Butterick pattern but wanted a fitted skirt because of time constraints (making the appropriate undergarments for a fuller skirt would have been time consuming) and because I adore the 'wiggle dress' style that was popular during that time. So I drafted a pencil skirt pattern to attach to the bodice. Naturally, since it was a last minute dress there were a few things that I would change if I were to re-do it...and I probably will go back and revamp it before I the next time I wear it. All things that could have been forseen if I had done a mock-up first. But, all in all I was happy with the result. Mostly because I adore the fabric - it has been sitting in my fabric stash for at least five years. I tried selling it on etsy but didn't have any luck - now I'm very thankful that it didn't sell! It's hard to see in the picture, but I was able to find a fabulous vintage cocktail ring that matched the rust colored design in the dress perfectly - only about an hour before the party started. And earrings to match the vintage yellow bracelet that I already had. Perfect! This is a great pattern that would work well for a modern dress, especially with a narrower style skirt.